I think readers would very probably appreciate a very famous series of hand drawn walking guides to over 200 individual walks in the "fells" and hills of the English Lake district (Beatrix Potter country). These were made by Alfred Wainwright who lived in the lake district and was a passionate walker. They are superb examples of data integration. 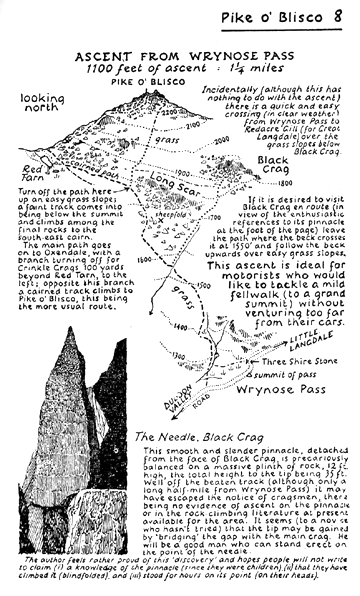 They include (all hand drawn) text descriptions of the walk, views from the start, views from the summits including angular arrangement of key features visible and distances, topographic information, maps, personal commentary and humour etc. A typical (but by no means the finest) image is shown below from Wikipedia. His book series (A Pictorial Guide to the Lakeland Fells: being an illustrated account of a study and exploration of the mountains in the English Lake District) is still in print and over 2 million copies have been sold. The books were made by him to be used as the walker progressed through the walk and are therefore very nice examples also of "Instructions at the point of Need". A nice collection of Wainwrights own favourite walks has been published recently (see Amazon.co.uk = http://tinyurl.com/3y56tz including some nice "Look Inside pages").